If you begin to experience a decrease in water pressure or flow, the issue will often be within your plumbing system. Below are some of the typical things to look for when troubleshooting a low pressure condition. The above picture shows a typical private shut-off valve. Check Shut-Off Valve: If there is low pressure in your home or business, the first step is to ensure the main water valve into the home is completely open. 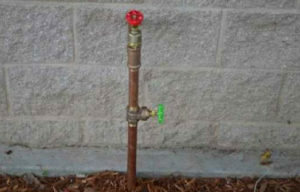 Most homes and businesses have a private shut-off valve commonly known as a house valve(see picture below). The location can vary, but your house valve is normally located on the outside of your home or business. It may be in the front, on the side or in the backyard.This valve, which allows you to shut the flow of water off to the home or business, can hamper flow if it’s not fully open. Even if slightly closed, this valve can restrict flows and decrease the water pressure. The above picture illustrates an aerator blocked with mineral deposits. Clogged Aerators: If the low pressure is isolated to a certain faucet, the problem may simply be a clogged or blocked aerator. Shut off the water and unscrew the end of the faucet, and check the aerator screen for rust, debris, scale or other particles that may be restricting flow. 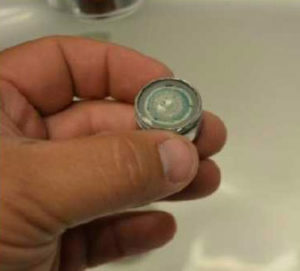 In most cases it is easy to simply clean the aerator by removing it from the faucet and rinsing the screen with water. The District also offers free water efficient replacement aerators. Contact our office at (916) 483-2452 for more information. Low Pressure(Hot Water Only): If the low pressure seems to only be affecting the hot water, there could be a problem with your water heater. Check the shut-off valve near the water heater, making sure it is fully open. You may need to consult a licensed plumber to evaluate the condition of your water heater and determine if it is affecting your water pressure. The above picture illustrates an interior view of a galvanized pipe with mineral deposits. 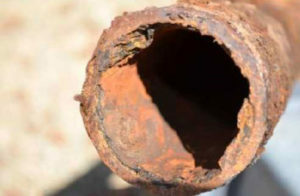 Mineral Deposits: In older homes, plumbing such as galvanized piping can often be found. Over time, mineral deposits can form on the inside of the pipe and thus decrease the inside diameter of the pipe, as well as making the inner surface of the pipe rough. Although this corrosion does not pose a health threat, this will restrict your flow and pressure. In some cases it may be necessary to replace galvanized pipes that have severely restricted water flow due to mineral deposits or corrosion. 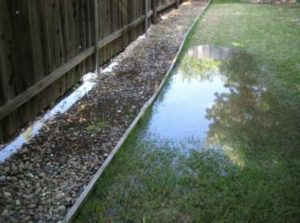 The above picture illustrates water run-off due to a leaking irrigation system. Water Leak: A leak can affect your water pressure as well. If you can hear water running check both inside and outside of your property for a leak. The most common leaks inside the home or office occur in the toilet. The most common leak on the outside of the property is in the irrigation system. Water System Demand: If the pressure seems slightly lower at certain times of the day, you could be seeing the result of a peaking demand on the water system. There are generally two peak periods throughout the day. One is first thing in the morning when most people are getting ready for work or school. The other is in the evening when people are getting home from work. During peak times customers are often washing clothes, showering, or irrigating landscapes and may notice a decrease in pressure. The above picture shows a typical irrigation system timer. 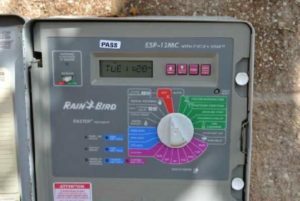 Irrigation Systems: If you notice that your irrigation system is not functioning as usual check to see if one of the above conditions exists. Many times a reduced flow in irrigation can be attributed to peak demand times. The best solution is to water during non-peak times. If you are unable to determine the cause of low pressure, call our office at (916) 483-2452 to see if there is maintenance being performed in your area by District crews.